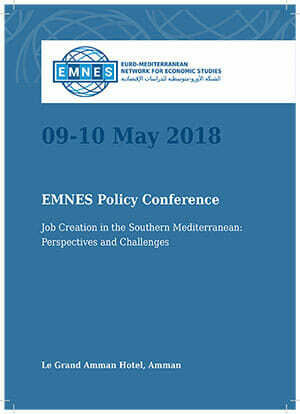 The Euro-Mediterranean Network for Economic Studies (EMNES) organizes the policy conference “Job Creation in the Southern Mediterranean – Perspectives and Challenges”. The event will take place in Amman on 09-10 May 2018. The high unemployment can be considered as a fertile soil for social and political frustration, which may lead to illegal migration, radicalism, and violence. Thus, the consequences of unemployment can affect not only the single countries, but the surrounding region as a whole. Therefore, designing a model of inclusive and sustainable development centered on employment should be considered as a common interest between Southern Mediterranean and European countries and a key to defuse political frustration and prevent radicalization. EMNES policy conference aims at providing a platform for discussion on the socio-economic roots of unemployment in the region and on the perspectives and challenges for job creation for developing a policy roadmap to solve the problem of unemployment. The conference is organized under the patronage of His Excellency Prof. Dr. Adel Al Tweissi, Jordanian Minister of Higher Education. Further, the conference is proud of a long list of outstanding keynotes, senior policy makers and experts, well known economists and commentators. Among them, there is H.E. Prof. Dr. Wajih Oweis (Senator and Former Minister of Higher Education), H.E. Dr. Ziad Fariz (Governor of the Central Bank of Jordan and Former Minister of Finance), H.E. Dr. Sudqi Al Omoush (Deputy Secretary General of the Union for Mediterranean), Prof. Dr. Zaydan Khafafi (President of Yarmouk University) and others. The Euro-Mediterranean Network for Economic Studies (EMNES) is a network of partners and associates research institutions and think tanks working on socio-economics in the Euro-Mediterranean. The EMNES project is co-funded by the Euro-Mediterranean Economists Association – EMEA and the European Commission.